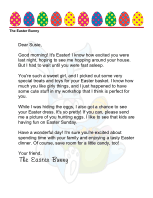 This printable letter from the Easter Bunny expresses hope that the recipient enjoys the special stuffed animal for them left in their Easter Basket. Happy Easter! 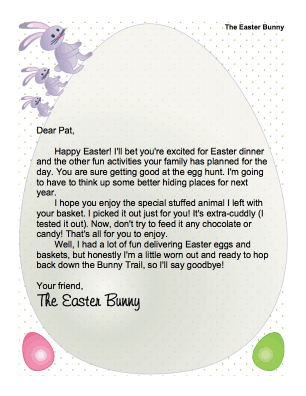 I'll bet you're excited for Easter dinner and the other fun activities your family has planned for the day. You are sure getting good at the egg hunt. I'm going to have to think up some better hiding places for next year. I hope you enjoy the special stuffed animal I left with your basket. I picked it out just for you! It's extra-cuddly (I tested it out). Now, don't try to feed it any chocolate or candy! That's all for you to enjoy. 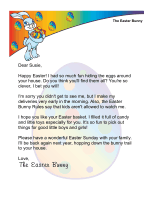 Well, I had a lot of fun delivering Easter eggs and baskets, but honestly I'm a little worn out and ready to hop back down the Bunny Trail, so I'll say goodbye!